(Click on underlined title to see more) The trio, a common match-up in coastal cliff areas; these are at Blacks. With South african annual iceplant. The trio with Mirabilis californica. (Click on underlined title to see more) Top photo is a mix of red flowered and orange flowered Diplacus aurantiacus, yellow Eriophyllum confertiflorum, Bluish-white Salvia mellifera, grey-green Artemisia californica, and Elderberry in the background. Top photo in Rancho Bernardo, the three lower photos are near Mt. Miguel close to the Jamacha Blvd/94 freeway intersection. (click underlined title to see more)Yellow Pincushion, an annual, grows to about a 12" to 16", blooms mid-Spring to mid-Summer. 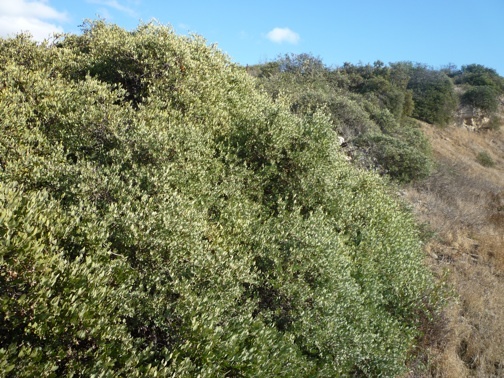 In the bottom photo, growing amongst it, are Lessingia filaginifolia, with the wispy silvery foliage, and the silvery leaved, low-growing form of Croton californicus. Buckwheat(Eriogonum fasc.) growing immediately behind them all.